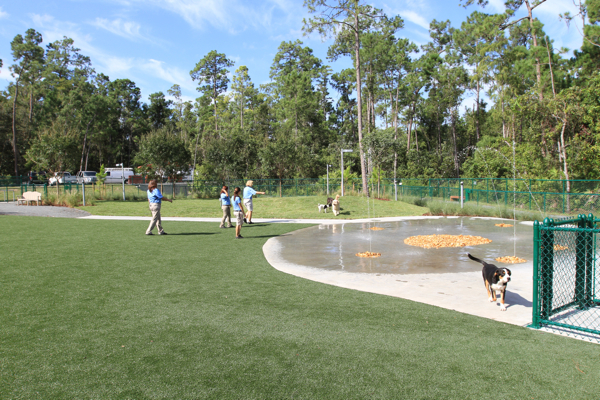 Best Friends Pet Care at Walt Disney World opened its doors today, offering a luxury, full-service pet resort with a wide range of activities, amenities and extras. 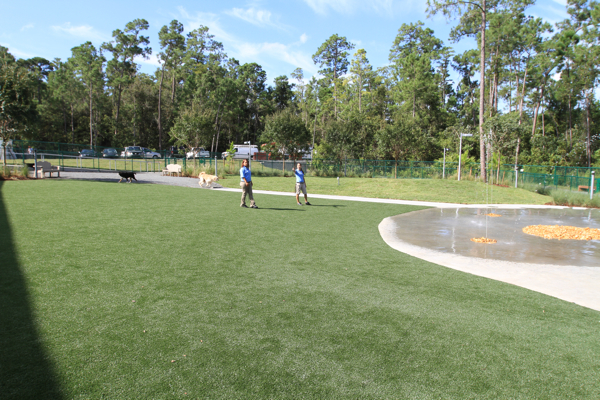 Located across from Disney’s Port Orleans Riverside Resort, this 50,000-square foot complex includes accommodations for up to 300 dogs, cats and pocket pets. 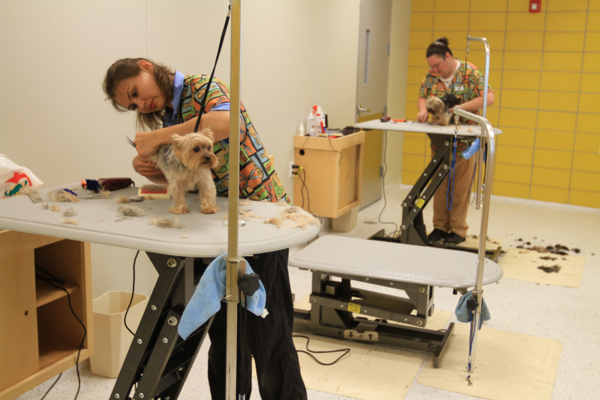 It also includes a full-service grooming salon and two 1,100- square foot doggy day camp rooms. 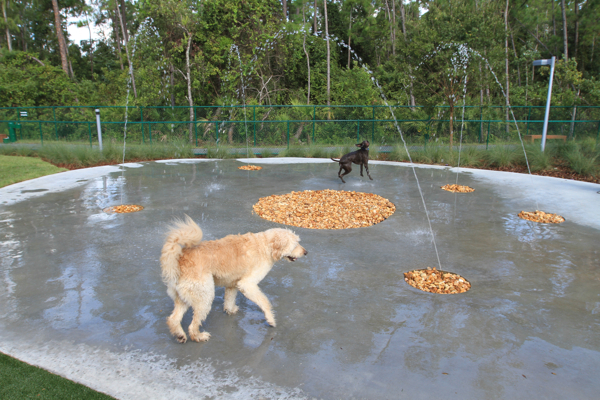 The outdoor areas consists of 10,000 square feet of covered patios and play areas and a 25,000 square-foot private dog park, which is reserved exclusively for the use of the Best Friends guests. 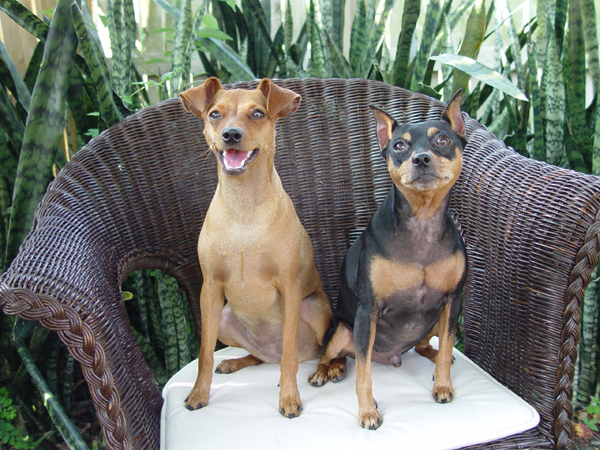 Let me start by saying that my wife and I are the owners of two very spoiled dogs, Bailey and Zoe (Miniature Pinschers). Before our children came into the world, our dogs were the babies of the house, and my parents referred to them as the Grand Dogs. Even now with children in the picture, our vacation plans still include the question, “What are we doing with the dogs?” Asking someone to watch our youngest dog, Zoe, reminds me of what Dennis the Menace’s parents went through when calling the list of past babysitters. She’s a sweet dog, but I swear she needs doggy diapers. 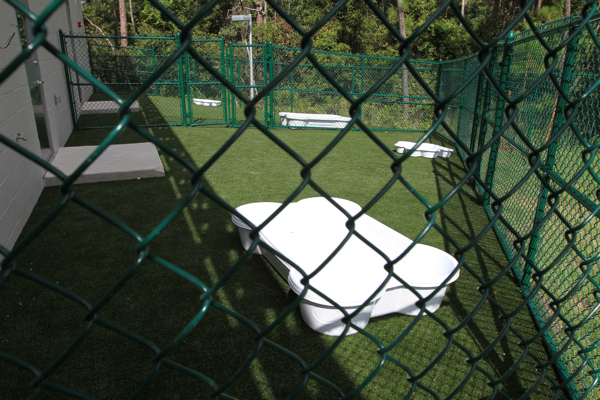 For the past few years, we’ve been leaving our dogs at high-end pet care facilities, or so we thought. 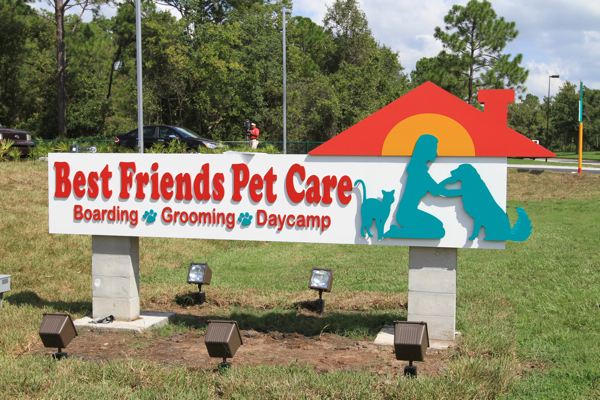 My opinion of these places have changed after touring the Best Friends Pet Care at Walt Disney World. 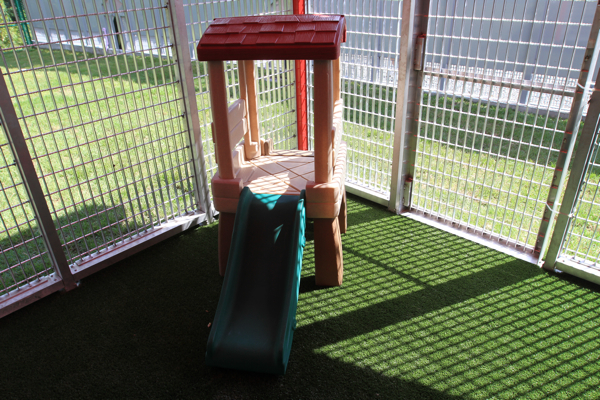 The pet resort offers high-quality overnight boarding and daycare, grooming services and doggy day camp. 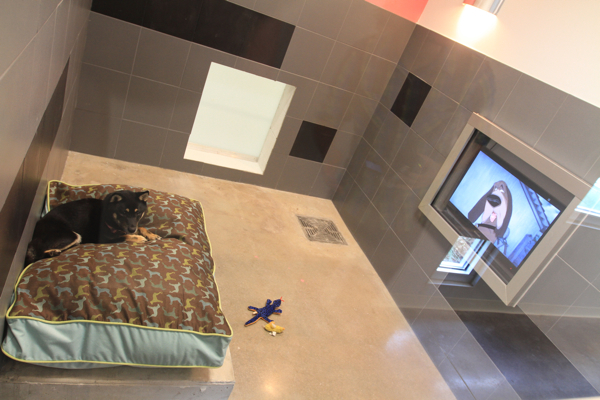 The doggy day camp room is equipped with a webcam for your viewing pleasure. 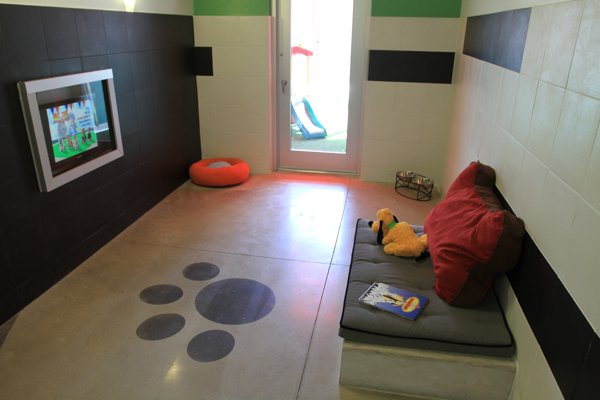 All suites are climate-controlled and include a pet cot for comfort. 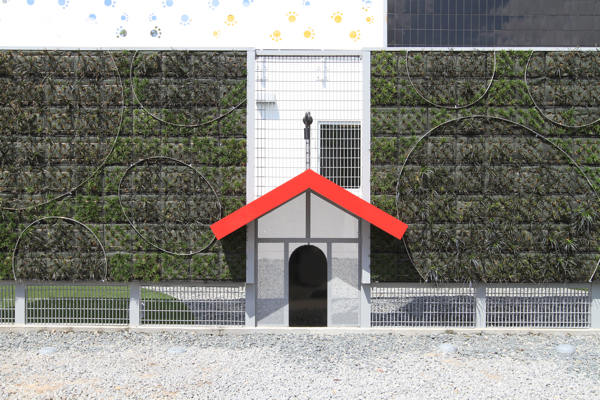 If your dog is not a VIP, the next option down is the Vacation Villa. Poor non-VIP dogs! I think Lindsay Lohan would’ve taken this option over the room she had in the big house. Each of the 14 villas include a 72-square foot tiled bedroom with a raised platform bed, a flat panel TV, and a 28-foot private outdoor patio. 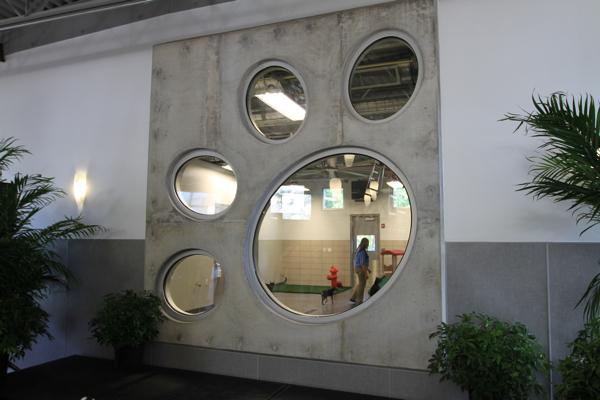 The TV stations include Animal Planet and the Disney Channel. For moderate-type people, like me, there are the Indoor-Outdoor 2-Room Suites. These 36- to 48-square-foot suites include an indoor bedroom with pet cot, and an outdoor patio. One walk is included each day. I wish I could show you a photo of this but they were not allowed. 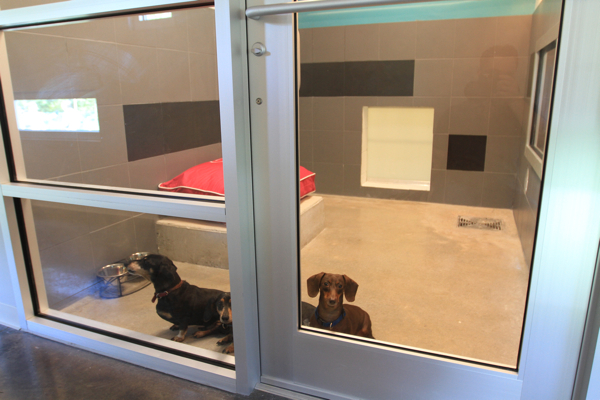 These suites are basically (very nice) cage-type enclosures with the 2nd room being an opening to another suite. In my opinion, these seem very roomy, but I do have two small dogs. For the value dogs, there’s the All Indoor Suites. 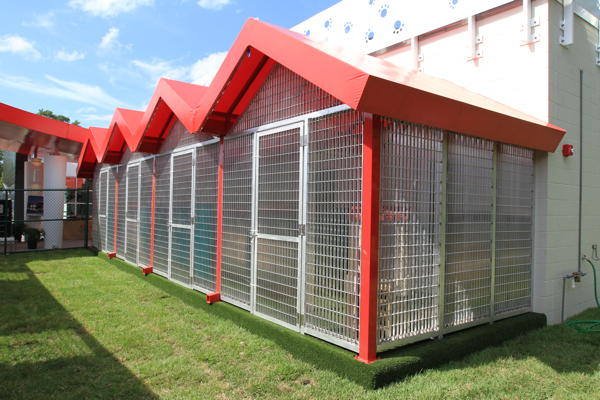 While still very roomy, I would consider this more of a Kennel-type enclosure with two sections for the dog to move. 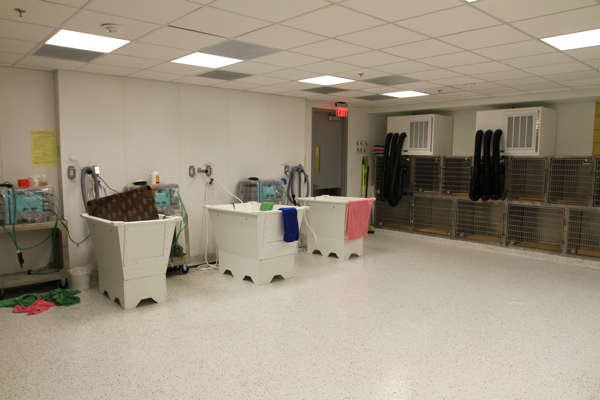 This is a luxury facility, so the service provided here will never compare to your local Veterinary boarding or Kennel. It’s not even in the same league. 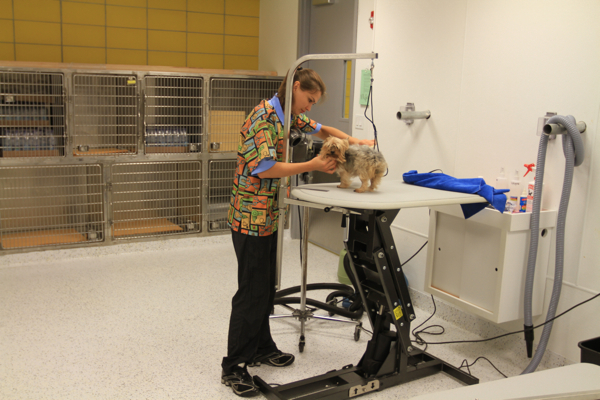 The Associates here treat every pet with the highest quality care and attention, no matter what level of boarding you choose. *Hourly daycare rates are available. In addition to the prices above there are some a la carte offerings for dogs. I’ve never owned a cat but the accommodations here seem very nice. 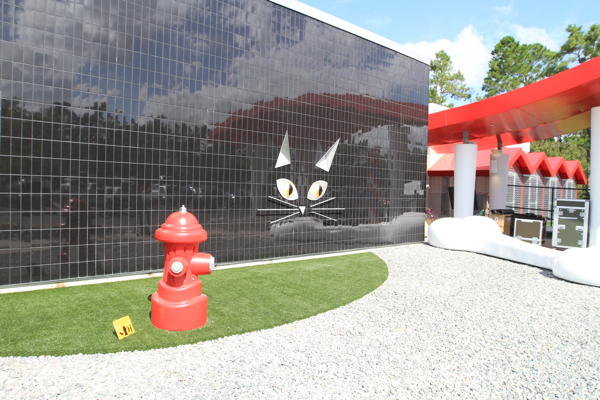 The Kitty City sanctuary is located away from the sights, sounds, and smell of the dogs. 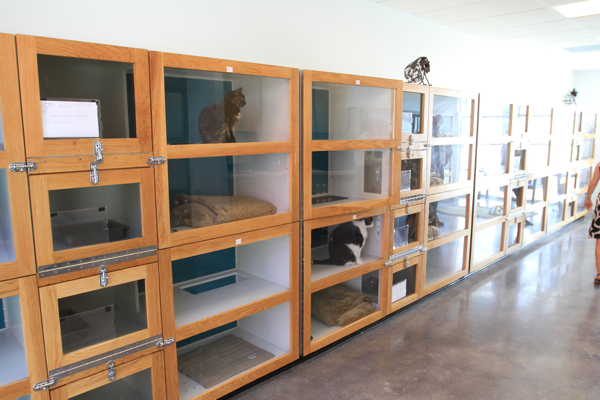 The entire section holds up to 30 feline guests where they can watch the world through the windows of two or four-level condos. Each condo has a private “relief” area. The four level ones have two. In the photo below you will see that each column has a few openings for the cat to move to different levels. Two level condo with one side area. 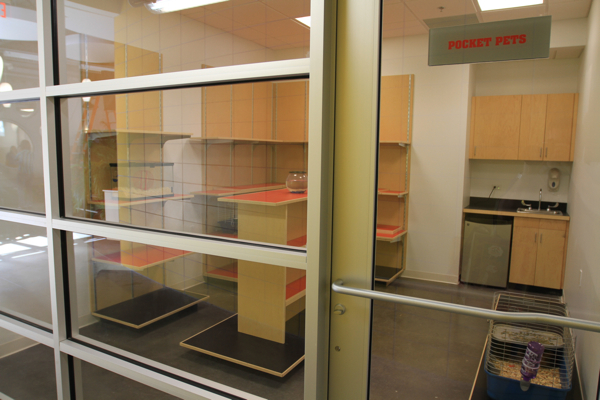 In addition to the prices above there are some a la carte offerings for cats. 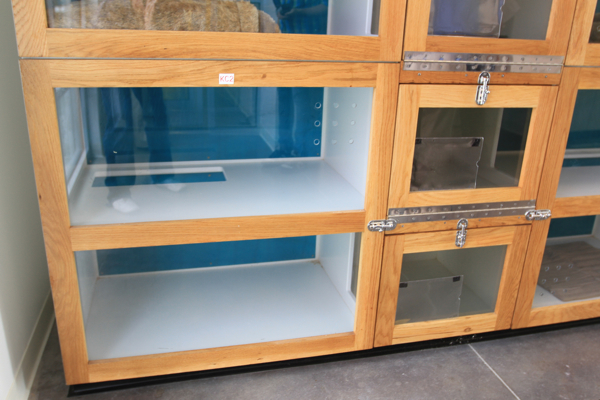 In addition to dogs and cats, Best Friends Pet Care provides a safe little haven for “pocket pets” such as hamsters, guinea pigs, rabbits and ferrets. 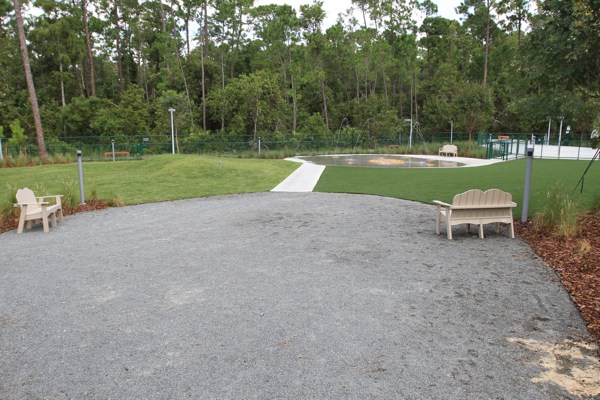 Fees range from $12 to $23 per day ($10 to $21 for resort guests) depending on the size and type of pet. You have to provide your own enclosure. 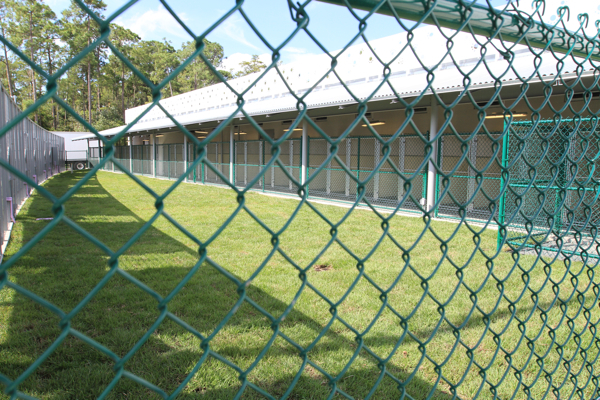 Exotics, venomous pets, and primates are not accepted for boarding. 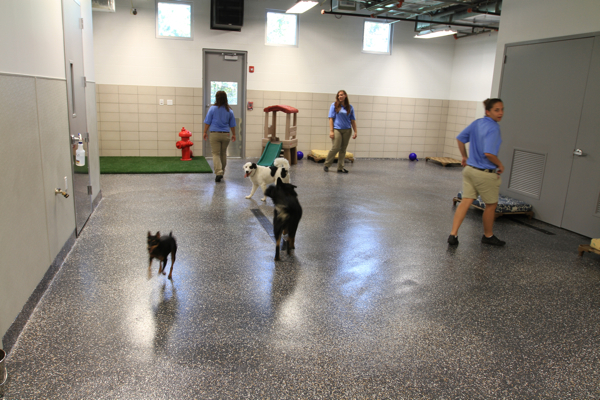 Unlike some boarding facilities, Best Friends Pet Care at Walt Disney World will let you tour the facility. For me, I find comfort in knowing that they have nothing to hide. It is similar to a restaurant having an exposed kitchen for diners to see.